What is the Best Infrared Gas Grills? Here's a Precise List! Infra-red grilling is an additional indirect heat source that is integrated into standard grill units and adds an extra dimension of heat for preparing meals that require optimum heating layers. The infra-red element is a nice way of saying the heating element since infra-red is essentially heat. 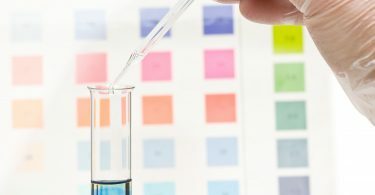 Heat is when molecules are excited to a very fast level, so a flame is infra-red, and the color red is used to identify the color that the heat wave of heat is coming across. Hence, when you see a flame with yellow and red, you see infra-red. For comparison, when you put on a pair of infra-red detection goggles, they are used to detect heat which every living organism produces, as such, you can see the heat signature of people with infra-red detection. Now that you understand this, you begin to comprehend the PR BS that stands behind the use of the word Infra-red. It’s a marketing way of saying another heating element that can use any energy source that generates heat. Infra-red heat in the grilling world is usually associated with an indirect heat source such as a heated ceramic block, but even standard electric heating elements produce infra-red heat, so if you have a gas grill that comes with an infra-red heating element, it basically means that the grill unit is a standard gas grill with an added electric or gas heated indirect heat sources such as ceramic tiles, or metallic bars or grids that provide an extra element of indirect heat. There are many types of infra-red burners on the market today, and these include heating up several layers of stainless steel emitters to stop all convection and deliver only radiant heat. The older style burners use ceramic tiles that emit radiant energy but still deliver hot air, which means they are around 50% efficient. Some infrared-red burners have a separate energy source, while others use the gas in the gas grill system to heat up the indirect infra-red burners. 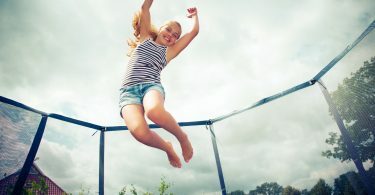 Infra-red grills generate more heat, they also heat up faster and manage higher temperatures, as such their materials and construction is much better than a standard grill. An infra-red grill has a temperature range that goes above 700oF, as such, they are expected to sear faster and also maintain heat for the warming racks at a better-controlled rate. The bottom line is that an infra-red units only real advantage over a standard unit is that it heats up faster. Cooking is not about pumping up the heat; you are not melting iron to cast into shapes. Cooking is about using the correct temperatures, maintaining the correct environments and heating up and cooling down food according to recipes. Infra-red heating units are like blast furnaces, and if you don’t know how to use one, you will burn everything to a cinder. Now let’s take a look at the five best-infrared gas grill units. This is the Char-Broil The Big Easy TRU-Infrared Smoker Roaster & Grill. The Big Easy® Oil-Less Turkey Fryer is the ultimate in infra-red heating with gas and indirect heat at the same time to create a perfect environment for cooking large portions such as a whole turkey on a rotisserie. 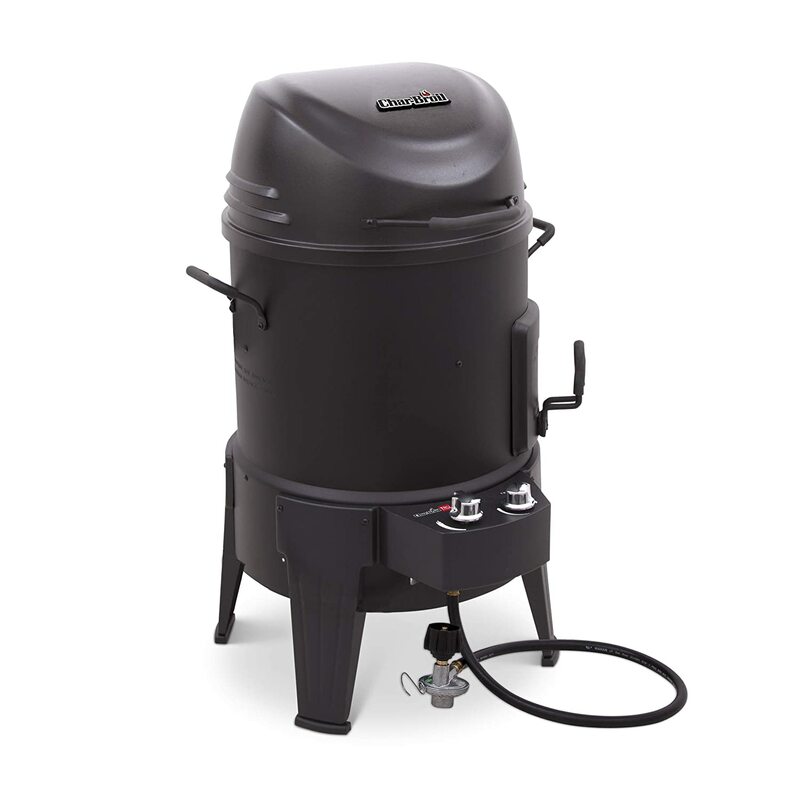 This model uses a standard rotary ignition knob and comes with a handy grease tray that is set at the bottom of the “barrel” and captures drips for easy clean-up. The roaster unit is barrel-shaped and designed to provide an even cooking environment for all types of meat, fish and vegetable products. The unit comes with a stainless steel grill grate that is st at the top for barbeque style grilling, and a Gas TRU-Infrared™ heating element for extra heat. This model generates 18,000 BTU’s and has a 1,200 square inch capacity to hold up to 21 lbs of meat, or a whole turkey. The grilling surface is 180 square inches. This is a 3 in 1 model that is used as a conventional gas grill or as an infra-red supported gas grill cooking unit for slow cooking large cuts. There is also a side-mounted smoker box too. This models dimensions are 36.2” H x 23.4” Diameter, and it weighs 50 pounds. This is an exceptional bespoke design for cooking whole turkeys with indirect infra-red heating elements. 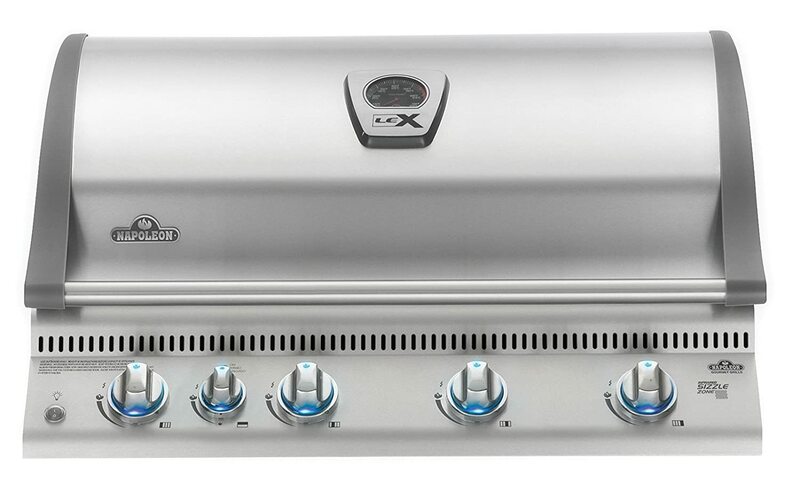 The Napoleon LEX605RBISS or LEX 605 Built-In Gas Grill with Rotisserie Burner is a high performance grilling station that is designed for professionals. The price reflects the quality of this product and the engineering design that integrates the bets of indirect infra-red heating elements with gas burners. This model comes with 3 main burners that deliver 16,000 BTU’s and are made from 304 stainless steel with stainless steel sear plates and tubing. The overall cooking surface of the sear plates is 605in², and the added infra-red element generates an additional 16,000 BTU from a bottom ceramic infrared burner and another 15,500 BTU’s from a rear ceramic infrared burner. This model can produce heat that will melt aluminum, brass, bronze, and zinc, so why they boast about this temperature is beyond me, unless they intend to use it for sculpting bronze statues while cooking the sculptors meal at the same time. This grill uses the char-broil patented “S” style 304 stainless steel wave grill grates provide superior heat retention and allow professional style grill marks. The infra-red back burner is used for rotisserie cooking and provides an even heat searing the meat as it rotates evenly, and the Accu-Probe temperature gauge gives you an accurate grill temperature reading. This is a hot one; you can use it to cook food or to melt metal, take your pick, quite exceptional, and very useful in the right hands. 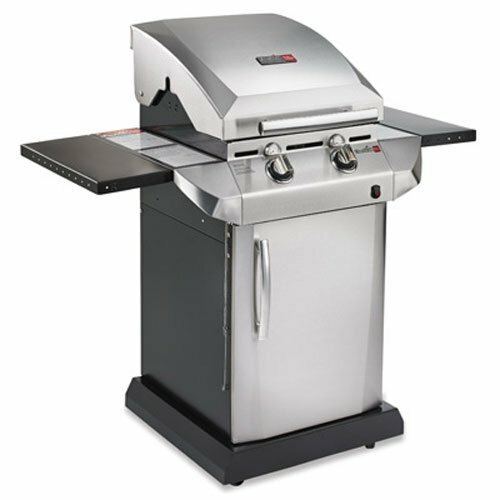 The Performance™ TRU-Infrared™ 3-burner grill is a professional level gas and infra-red grill model. This is a compact design that gives you 340 square inches of primary cooking on stainless steel grates. It also has an additional 125 square inches of secondary cooking on porcelain-coated warming rack and comes with two stainless steel burners that provide 20,000 BTUs. This model generates 65% of its heat through infrared that is evenly spread across the entire cooking surface. It is made of stainless steel and comes with 4 casters for easy mobility. The overall design is a modern professional model with all stainless steel finish in a brushed satin, and black powder coated sidings. This models dimensions are 115.7cm x 58.4cm and weigh 41 Kgs. 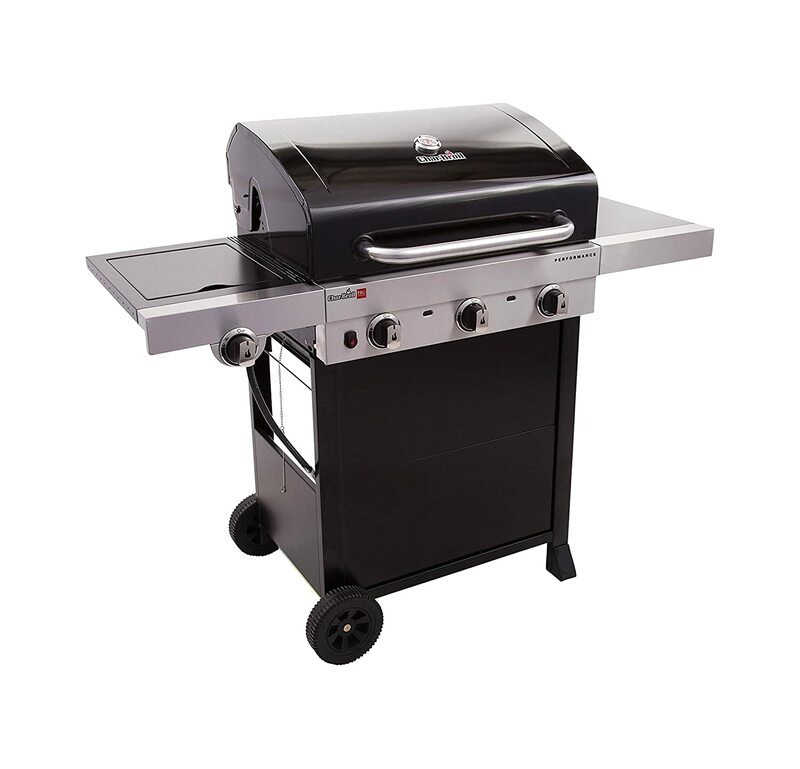 This is a classic compact gas-infra-red combo grill that comes with great performance but carries a hefty price since you are paying for near perfect cooking environment experience. This Char-Broil® Commercial Series™ Signature 3-Burner Gas Grill comes with the TRU-Infrared™ Cooking System and is the home model in this series that comes at a very affordable price. This model comes with 420 square inches of primary cooking area and an additional 155 square inches of warming racks. The gas burners generate 21,000 BTUs and the side burners produce an additional 13,000 BTUs from the TRU-Infrared™ cooking system. This model uses the Char-Broil proprietary SureFire® Electronic Igniter, and the frame is a solid powder coated steel with two wheels for mobility. There are porcelain-coated cooking grates, and the did-comes with a mounted temperature gauge. Primary cooking area totals 420 sq. in. This is a great performance level infra-red gas cooking unit for the home and comes with an exceptionally budget friendly price. The Cook@Home 3D Electric Smokeless Bio Infrared BBQ Grill is another great infra-red gas combo unit that provides you with excellent heat levels and control. This model is a table top home based model that provides fast overhead infra-red heating that removes the need for oil, and also eliminates smoke from fatty products. Essentially this is a slow cooker grill, it uses gas to heat up an indirect infra-red heating element that radiates the heat over the products sitting below. 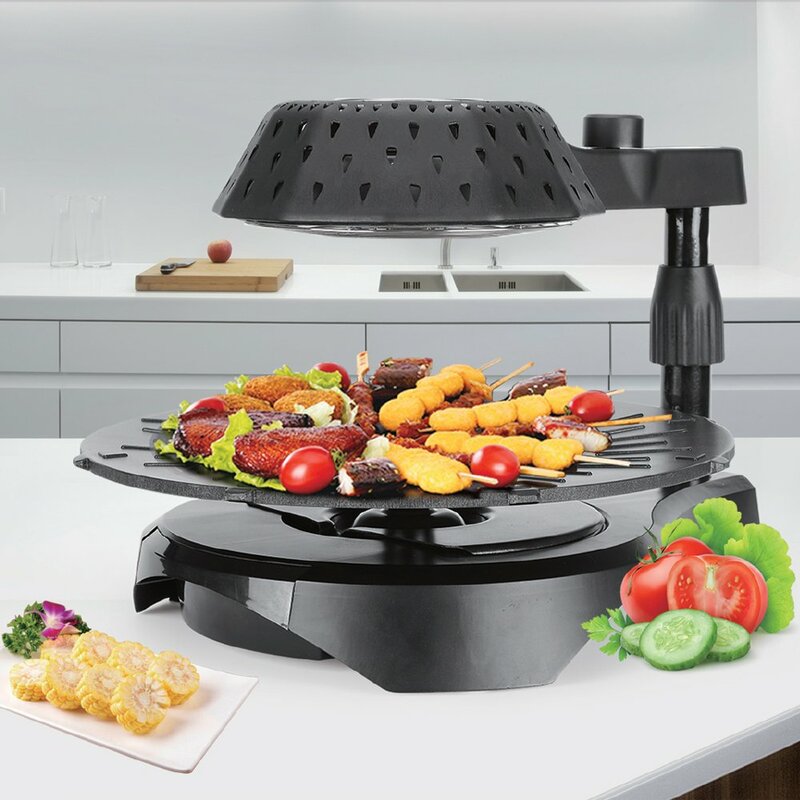 The grill plate is designed with a convex shape to channel all fats and oils into a collection tray, thereby eliminating smoke and keeping a clean cooking experience. This is the overhead griller for OCD Sanitary minded people that don’t want a hassle wita h direct gas flame, smoke, fire, fat and all the gooey gushy wonders of cooking sizzling meats over a fire. Yup, it finally arrived, the Vegan-friendly grill that can be used by carnivores too. What a delightful little package that is great for clean table top cooking experiences.